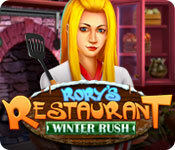 Rory's Restaurant: Winter Rush is rated 3.2 out of 5 by 11. Rated 5 out of 5 by An0therW0rld from Expert on 91 levels - couldn't resist! I have been well and truly addicted to this game and couldn't leave it be until I achieved all levels with an expert rating. 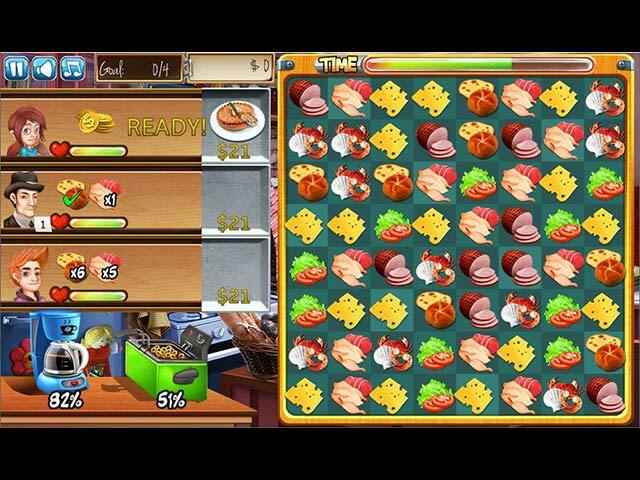 If you enjoy "real tight on time" time management games and match-3 play this is the perfect combination of the two! The game is not so well designed i.e. in the higher levels you don't always have the same amount of higher priced meals as you did at previous attempts to play the same level ... didn't put me off though. I have totally enjoyed the hard won accolade of 91 levels at expert - do you think you can do it too? Give it a go if you like a REAL challenge. Rated 5 out of 5 by lvd333 from TOTALLY FUN FUN FUN!! In spite of some low reviews, if you are into Match 3 with time management games, this one is FUN, as you progress through levels, it's does not get easier, after playing Demo...I was anxious to finish a level, but the match 3, clear pictures, gets hard to see 3 matching, because the food products are close in color and/or size, and I became anxious to find matches, they're there, but that is the challenge. It is NOT hard, just challenging when it comes to beating the clock, which makes it fun, so I had to buy, just to meet the challenges. You not only serve your customers their food orders, but you have a totally different section, where customers order dessert, not match 3, and it is fun, Fun FUN! There is a kitchen where you will have HOS with a zoom in button, not hard, you just got to scope around...I loved it. Graphics are nice and comfortable, you get to buy and upgrade recipes, vegetables. I could go on but you will enjoy a great match 3, time management Game. Just try! Rated 5 out of 5 by megs56 from LOVE GAMES LIKE THIS A lovely little match 3 game but involves serving/pleasing people to get top tips. This game is not as easy as it seems, so I will replay for the expert rating. I am enjoying it, thank you BF! Rated 5 out of 5 by lindayah from Fun Addictive game! Not too challenging but something fun to do while bored passing time! Rated 3 out of 5 by FlashyFisher from An ordinary match3 game, need something new I love match3 game, but the theme is too mainstream The gameplay was fine, the graphic is okay The only problem is just too ordinary match3 game. Rated 3 out of 5 by cowclaudia from Just ok Would probably have enjoyed it more if the food items were better designed in both clarity and color - they pretty much looked the same making it hard to speed along at times. Music was rather annoying. Rated 3 out of 5 by pennmom36 from Better Than The Original But Still Not That Gr8 I lasted about 15 minutes in Rory's first Restaurant, the food was horrible and so was the game. I will give them credit for trying, because I was able to play most of the demo of Winter Rush. 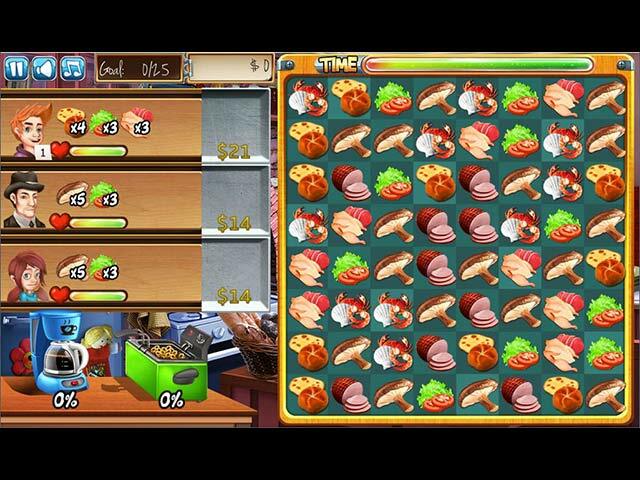 I still don't get why this game would appeal to either Match 3 fans or Time Management fans, (because this is a cross between a Time Management game and a Match 3) it simply doesn't work, and the tile "ingredients" are very difficult to find matches for because it's hard to diferenciate between them. The goal is to match at least 3 of the same ingredients in order to fulfil the customers order. The customers show up on the left side of the screen and two or three ingredient combinations are shown with numbers on each ingredient indicating how many matches you'll have to make of each ingredient, to complete their order. When all ingredients have been collected, you click on the money to collect it and another customer takes his place. You can click on specific customers to prioritize who gets served first, because some customers pay better than others and serving them quickly will net you more money. The money earned is used to purchase more recipes, or upgrade existing ones, thus, giving you more ingredients on the board to match. There are 10 Achievements to earn, and after completing a few levels, you will play some sort of Mini Game. 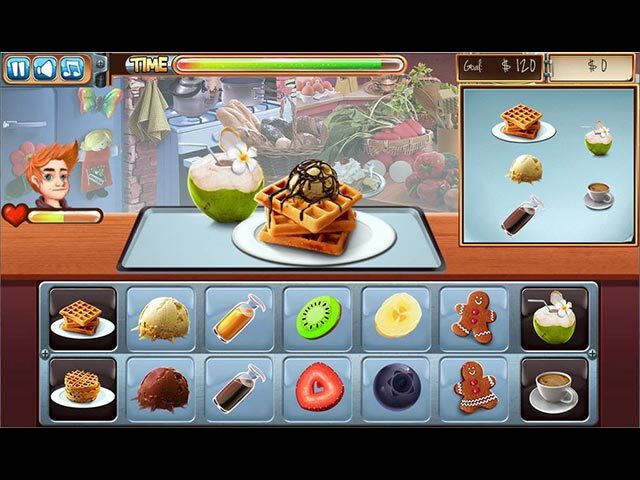 In the demo, there are two different Mini Games, an Interactive Hidden Object Puzzle, and a Waffle making game where you are tasked with serving customers their favorite Waffle ingredients in the correct order. All of this was boring for me, and has very little entertainment value, in my opinion, but who knows, you might just love this game so try the demo first. Rated 2 out of 5 by beckins from Icons too similar I only made it halfway through the trial before uninstalling. I found the icons were far too similar in color to make matches easily. At first, matching the buns had all the other ingredients filled by falling pieces so just had to keep matching the buns. But as more ingredients were added, it became very difficult to match any ingredients, let alone the buns. I already have this type of match 3 in my purchase history so I think I will go play one of those games instead. This may not be an issue for other players so give it a try and you may like it. It's just not for me. Rated 1 out of 5 by mommacheatham from Should have listened to everyone else I really should have headed the advice of the other reviews and skipped this game. Really sporadic in what I was to "make" or how to level up. The makers just tried to put too many game types in one game.